What an insane nightmare Chicago is right now, as with the windchill, its -40 degree Fahrenheit temperatures, and “ice quakes”, where the cracking ice creates sounds resembling gunshots, create an unthinkable amount of danger for the people of Illinois! 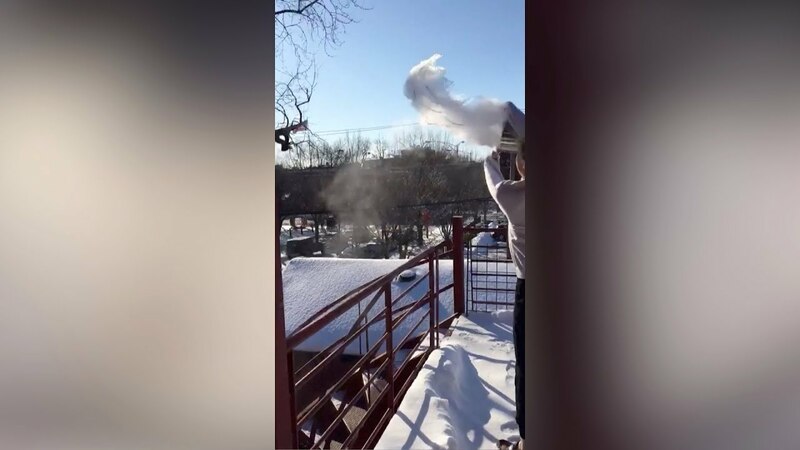 Well, at least there’s a new fun boiling water challenge that doesn’t end with people in the hospital — although horrifying dangers are still very, very much in the air — as Chicagoans fling a vat of boiling hot water in the air and watch in terror (it should be terror, anyway) as the water freezes into vapor. The front is being dubbed Chiberia, as temperatures are dropping below -40º. It’s so cold that railroad tracks need to be on fire to keep the trains moving, and the Polar Vortex is triggering the coldest arctic outbreak in at least two decades. A “Polar Vortex” is a meteorological term that’s used to describe this cold air and the circulation that occurs during the winter months over the Northern latitudes. Weather forecasts predict temperatures will return to normal by next week. But you know, in the meanwhile I guess, take some boiling water, and instead of making spaghetti, be reminded at your true fragility in the light of the unspeakable cold that wants but one thing — to devour you as if you were Mario, and it a piranha plant. Horror, horror and terror abounds! The real challenge right now in Chicago, I feel like, is just surviving, so good luck to everyone doing that. Wear 100 coats, all layered on top of each other, as you head into the terrifying winter, like a creature from Disney’s Frozen, or that Walter Simonson Thor comic where all the other Marvel comics wre frozen for a little bit. That was cool, I think. What do you think of all of this excitement? Let us know in the comments or on Twitter at @WhatsTrending.